Toppobrillo 281 Documentation Bundle – BOM, Wiring etc. The PCB is 76mm by 107mm. 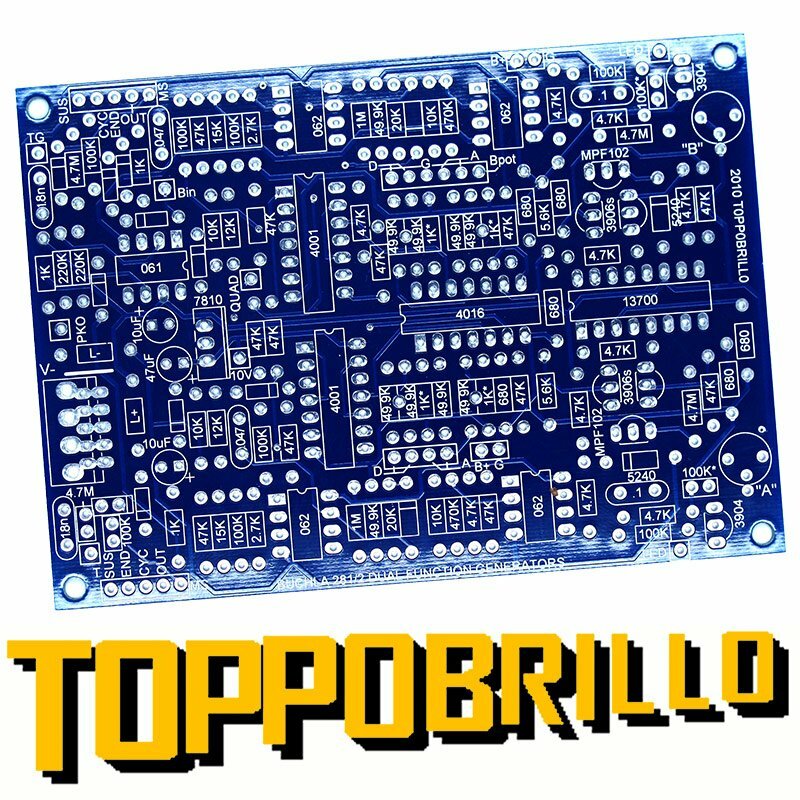 This Toppobrillo PCB is a dual function generator. Two AD envelopes with extensive CV control. It can run on both +/-15v or +/-12v (with some resistor changes noted in documentation). 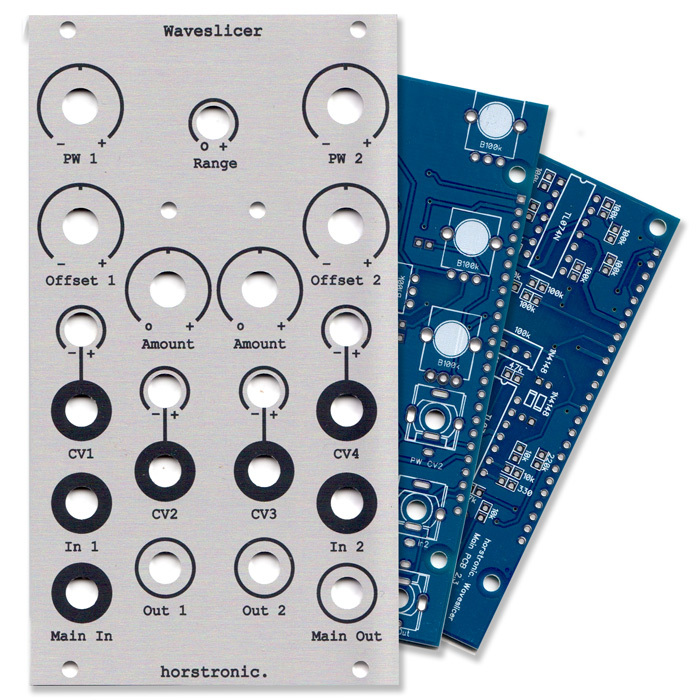 The Original Buchla 281 Module is made up of 4 independent Function Generators, A,B,C and D- with A&B and C&D tied together in the bottom section functions, quadrature and ors [peak]. 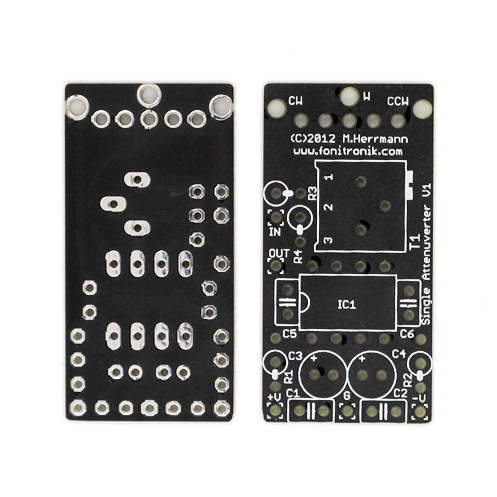 The 281 Clone PCB is actually half of a 281, and can be used alone or in conjunction with other boards. …Operates like most envelope generators, it’s operation is as follows: An appropriate signal at the trigger input causes the generator to ramp upwards from 0 to 10V at a rate set by the “attack” control and input. Depending on operation mode, once it reaches 10V, it is either held steady by a gate signal, pending release, or enters the decay phase instantly [depending on operation mode] and then ramps downward towards 0V at a rate specified by the setting of the “decay” control and input. At any point in the “decay” cycle, the generator can be retriggered. Once the cycle is complete, the “end pulse” output will produce a narrow pulse. The output function is linear, however, the rate [slope] responds to applied control voltage in an exponential manner. Applied positive voltages will cause the generator to ramp more slowly- while voltages that are less positive than the voltage at the control pot’s wiper will cause the generator to ramp more quickly. These voltages average together. “Gate” or “sustain” mode (ASR): when the attack phase is complete, the generator will not enter the “decay” phase until the “trigger” input goes low. Note that just about any signal that meets or exceeds the input comparator’s threshold (around +5V) will fire/sustain the FG. “Transient” mode (AR): when the attack phase is complete, the generator enters the decay phase, regardless of the status of the “trigger” input. Note that operation in this mode requires that the “trigger” input be one that has a relatively fast low-to-high transition, such as a pulse/square wave, or perhaps an inverted saw-tooth. The trigger threshold is around +5V built as shown. “Cycle” mode (LFO): when the decay phase is complete, the generator will retrigger itself. The cycle mode can be configured to respond to the “trigger” inputs as either “transient” or “sustain” modes. “Quadrature” mode: When this is selected, two generators are linked together in a loop configuration so that FG “B” will be slaved to “A”. This operation is as follows: FG “A” reaches it’s peak, FG “B” then begins to cycle, while “A” won’t enter it’s decay phase until “B” completes it’s attack; then, “B” will sustain until “A” ends it’s decay phase, at which time “B” begins to decay. Depending on the attack and decay times, the resulting relationship can maintain an approximate 90 degree separation of phase between the 2 functions. When the two function’s cycles are of similar length, the resulting waveforms are trapezoidal. “Peak” section: The Peak (called “OR” in the original module) section used here is a discrete TTL “OR” gate. I don’t know what this section in the original Buchla circuit looks like, but this one works pretty well. It’s output, at any given time, is the maximum, or peak of it’s input voltages. In the 281, the “A” function is input unattenuated, while the “B” function has an attenuator on it’s input. This allows the for the creation of complex envelopes between them. It is easy to add additional inputs to this simple circuit if it is desired. the narrow “end pulse” occurs at the end of a cycle. Note that this output pulse-transient can be large- on the order of +15V in amplitude (used w/15V PSU). This of course can be attenuated if this is thought to pose any problems with other circuitry.